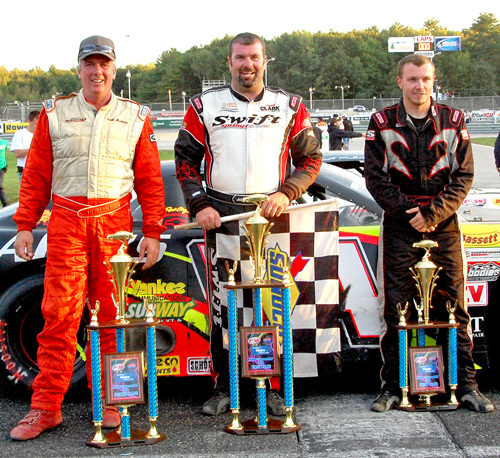 SCARBOROUGH ME (9/18) Johnny Clark reclaimed the lead on lap 220 of Sunday's PASS North 300 presented by Southern Maine Motors.com at Beech Ridge Motor Speedway to earn his seventh win of 2011 and his third in the Pro All Stars Series (PASS)North's richest race. 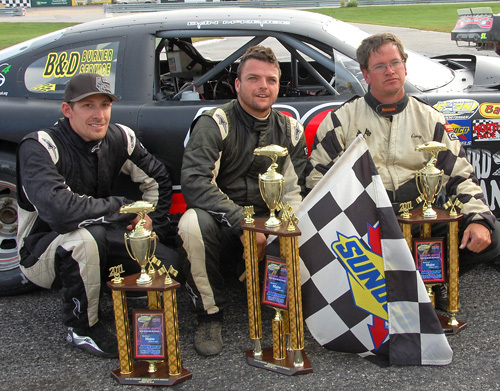 Scott Mulkern charged up through the pack to claim second and home track hero Trevor Sandborn raced home third. Clark started deep in the pack but by lap 98 he was knocking on leader Donnie Whitten's door.Two laps later he was in control. 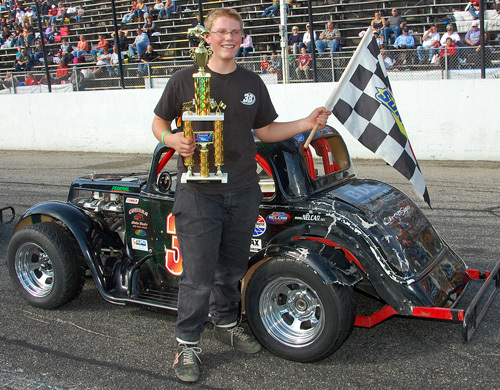 Clark lost the lead to Lonnie Sommerville for several laps but the five time PASS North champ reclaimed the point and kept it until lap 191 when Seekonk regular Tom Scully Jr. took over. Clark's rubber was worn out, but he got the break he needed when the yellow flew on lap 216.. Rubbered up and race ready, Clark took the lead from Brad Babb ten laps later and was never headed, leading the final seventy four laps despite the best efforts of both Mulkern and Sanborn. Clark's win was worth $10,000.00 plus the majority of the lap leader bonuses. His margin of victory was .362 seconds. Eleven of the thirty three starters completed all 300 green flag laps in a race that took just over two hours to complete. Beech Ridge regulars fared well in the 300 with Sanborn third, Dan McKeage 5th and Aaron Ricker 9th. Brad Babb spent some time in the lead before eventually finishing 12th. Bill Rogers ran up front early before settling for 13th at the checkers. DJ Shaw, Cassius Clark and Travis Benjamin each won a qualifier. 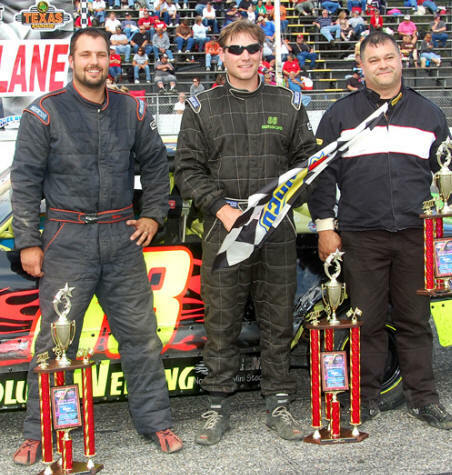 Consolation rounds went to Kelly Moore, Aaron Ricker and Johnny Clark. The PASS 300 was round four of the six race 2011 PASS National Championship Series, and neither title contenders had a good day. National point leader Ben Rowe finished three laps down in 18th but his nearest challenger, Jay Fogleman was 23rd 26 laps down after encountering mechanical problems shortly after the start. 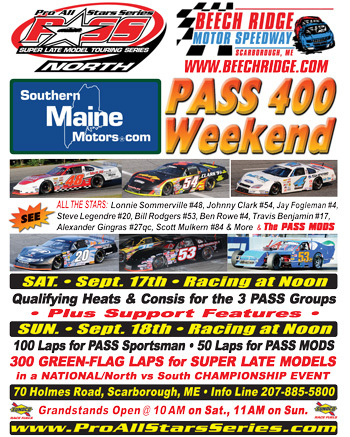 Both the PASS North and PASS National Championship series move on to North Woodstock's White Mountain Motorsports Park on Saturday September 24. Post time is 6:00 PM. SCARBOROUGH ME (9/18) When it comes to racing statistics, Dan McKeage and Andy Shaw have quite a bit in common. 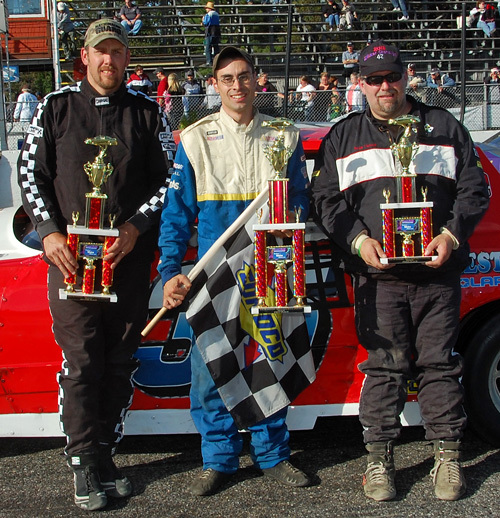 McKeage and Shaw are both defending PASS Champions in their respective divisions, and the pair successfully defended their 2010 wins on PASS 400 Weekend presented by Southern Maine Motors.com at Beech Ridge Motor Speedway Sunday. 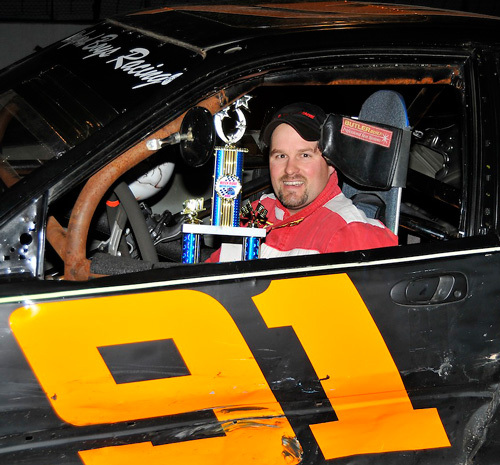 McKeage topped a thirty one car field in the 100 lap PASS Sportsman feature after a race long battle with Carey Martin, Joey Pastore, Donnie Morse and Clyde Hennessey. McKeage stole the lead from Carey Martin on a restart with eight to go and managed to keep Martin in his mirrors to the checker. Thw win was McKeage's second of 2011. Point leader Shane Tatro had a tough day;Tatro finished 24th after on track issues sent him to the pits early for repairs.The chase for the title has tightened up considerably as the season winds down.. 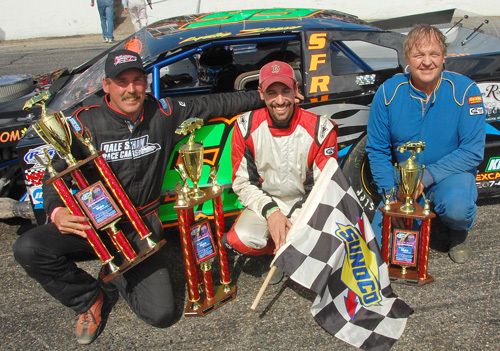 The PASS Sportsman join the PASS Super Late Models at White Mountain Motorsports Park on Saturday March 24th. Race time is 6:00 PM. 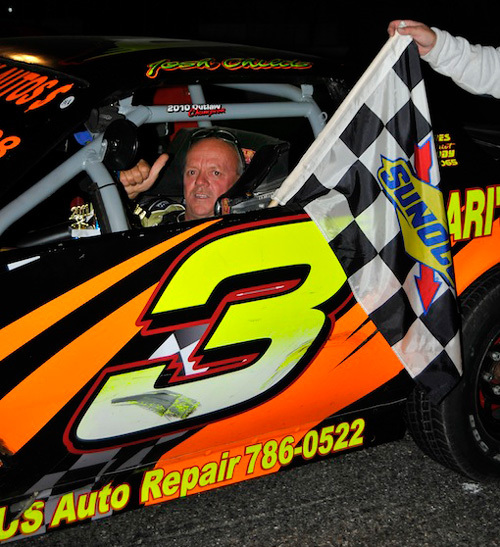 Andy Shaw turned the tables on his Uncle Dale in the 50 lap PASS Mod go. 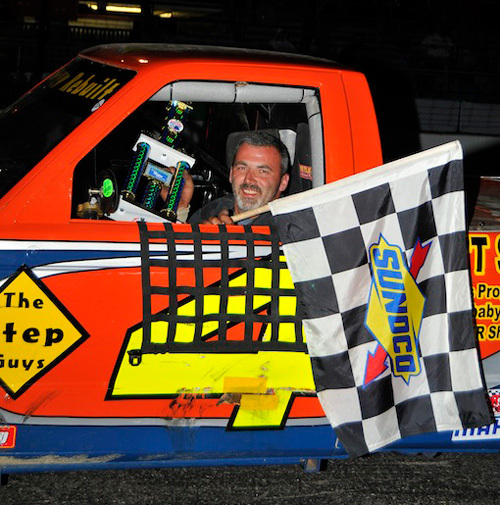 Dale beat Dana Reed and Andy to the line in Saturday's Mod feature but not this time It took Andy forty four laps to claim the lead, but once he got out front there was no stopping him. Dale had to settle for second with Alan Wilson third. The win was Shaw's sixth of 2011. 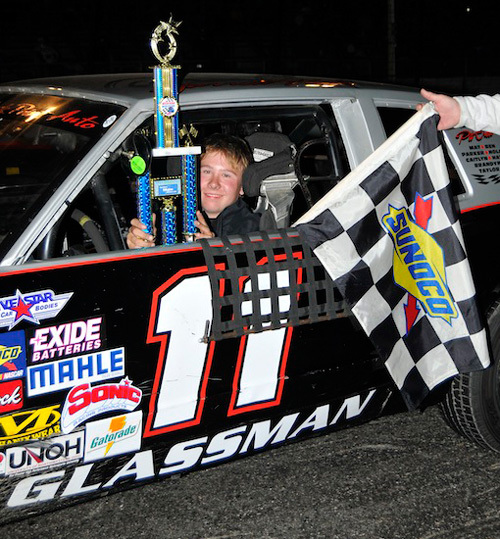 The PASS Mods will wrap up their 2011 campaign at Oxford Plains Speedway on October 1st. At 1:00 PM. #79 Keith McKinnon and #72 Charlie Colby tangle on the main straight. #60 DJ Shaw, #88t Alan Tardiff, and #84 Scott Mulkern damaged. Copyright 2001-2011 Pro All Stars Series, Inc.